A beam of ultraviolet light hits a swarm of rhodium nanocubes. Duke University researchers have engineered rhodium nanoparticles (blue) that can harness the energy in ultraviolet light and use it to catalyze the conversion of carbon dioxide to methane, a key building block for many types of fuels. A team of researchers at Duke University has developed tiny nanoparticles that help convert carbon dioxide (CO2) into methane using only ultraviolet light as an energy source. The team hopes to next develop a version that would run on natural sunlight instead of ultraviolet, a potential boon to alternative energy. Chemists have long sought an efficient, light-driven catalyst to power this reaction, which could help reduce the growing levels of (CO2) in the atmosphere by converting it into methane, a key building block for many types of fuels. 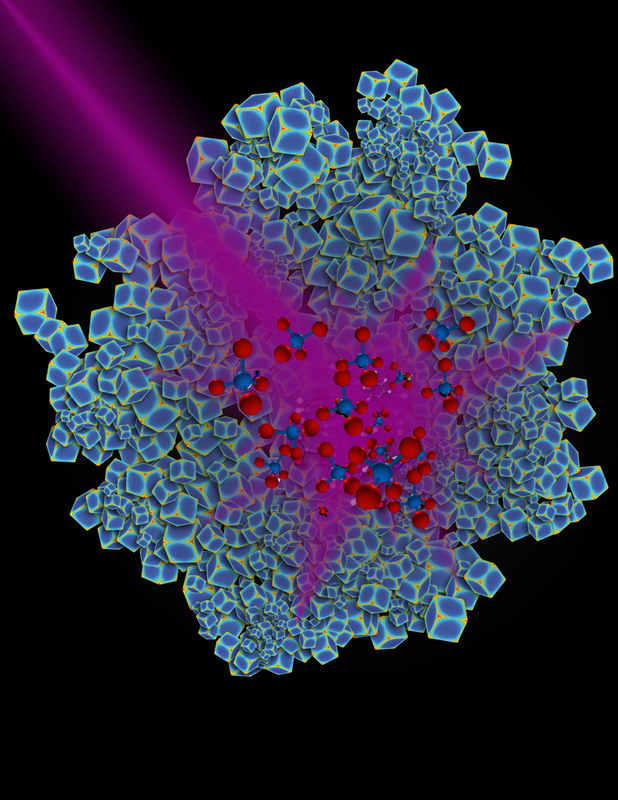 Not only are the rhodium nanoparticles made more efficient when illuminated by light, they have the advantage of strongly favoring the formation of methane rather than an equal mix of methane and undesirable side-products like carbon monoxide. This strong "selectivity" of the light-driven catalysis may also extend to other important chemical reactions, the researchers say. "The fact that you can use light to influence a specific reaction pathway is very exciting," said Jie Liu, the George B. Geller professor of chemistry at Duke. "This discovery will really advance the understanding of catalysis." The research was supported in part by a grant from the National Science Foundation to explore the fundamentals of plasmonic photocatalysis (grant CHE 15-65657).